Cobra is the Portuguese word for “snake”. 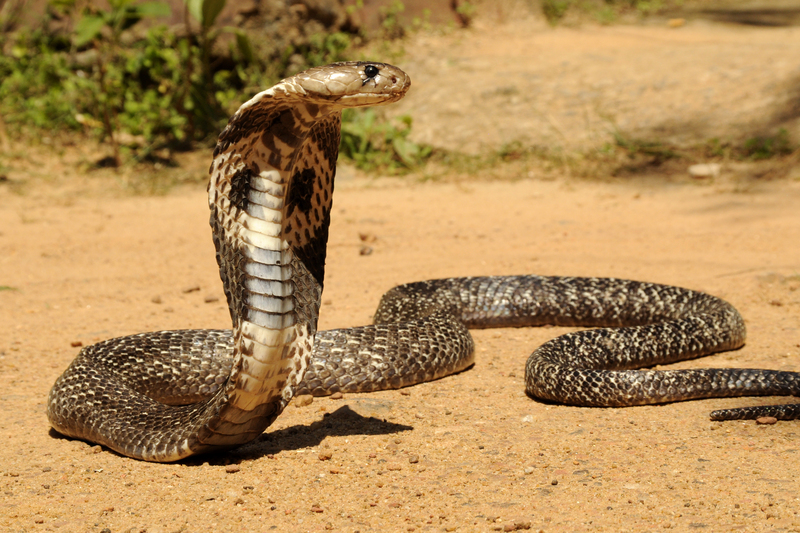 In English and in some other languages, it has been adopted as the name for any of various species of venomous snakes. Most of those species are in the family Elapidae, all of which are venomous. Most of them can spread their neck ribs to form a flattened, widened hood. Not all snakes commonly referred to as cobras are of the same genus, or even in the family Elapidae. The name “cobra” is short for cobra de capelo or cobra-de-capelo, which is Portuguese for “snake with hood”, or “hood-snake”. In some modern languages, such as Afrikaans, the other part of the Portuguese name was adopted, and the predominant name for a cobra in Afrikaans is “kapel”. When disturbed, most of these snakes rear up and spread their necks (or hoods) in a characteristic threat display, making them a favorite of snake charmers because of the dramatic effect. Long ago, snake charming used to be a religious ritual, though nowadays it has become an entertainment. Cobras, which may live up to 20 years, are found from southern Africa, through southern Asia, to some of the islands of Southeast Asia.